Our New Song "Cakewalk to Baghdad"
Get a signed Country Joe Band poster by Bob Masse at the Country Store. FREE Country Joe Band guitar picks at the Country Store. Our new CD, Live in Berkeley, is available at the Country Store. 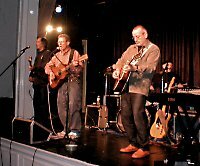 A video of the Country Joe Band's 2004 performance at Southsea, England, is now available on DVD here. 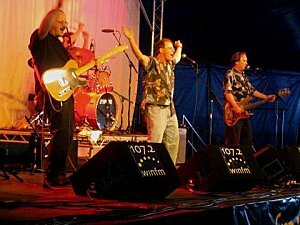 The Country Joe Band at the UK's Cropredy Festival in August 2005. Photo by Darren Beech of folking.com. At the Sixties Museum in Chicago, September 2005. Photos by Bob Shelli. A B O U T T H E C O U N T R Y J O E B A N D History was made one night in 1965 in Berkeley, California, when five men whose drive for political change and love of music would join forces in the first public appearance of Country Joe & The Fish -- a band that would change the sounds and sights of 1960s rock and roll culture. 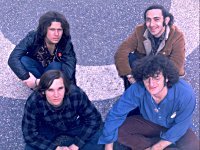 Country Joe & The Fish created a style of music that captured the feelings of many youth at the height of the Free Speech Movement. 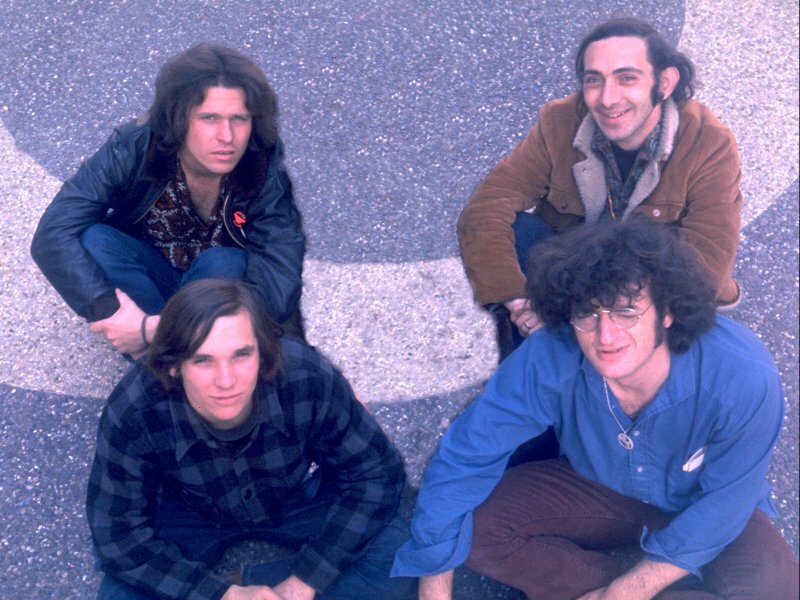 With songs such as "Sweet Lorraine" and "Section 43," Country Joe & The Fish became one of the first bands to create the distinct psychedelic sounds of the 60s era. One song in particular skyrocketed the band into stardom: "I-Feel-like-I’m-Fixin’-to-Die Rag" drove the band into notoriety with its saucy lyrics and its description of the harsh reality of a nation divided by war. 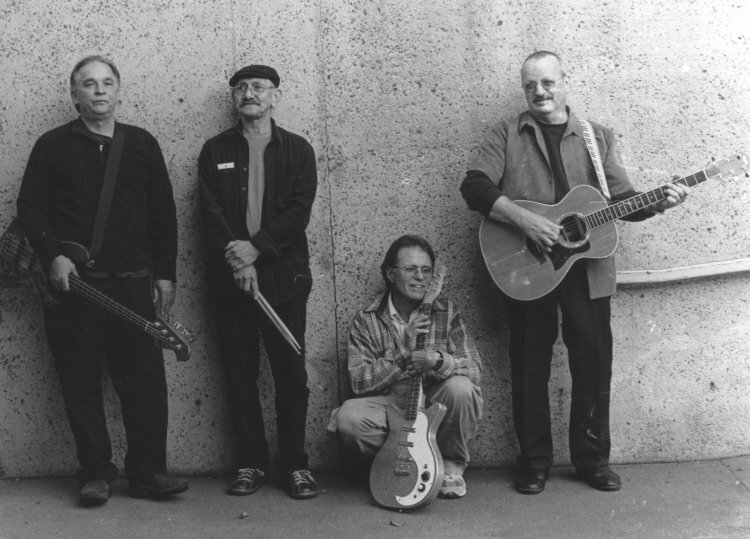 It is that recurring theme which has brought Bruce Barthol, David Bennett Cohen, Gary "Chicken" Hirsh, and Joe McDonald, back together again in the form of The Country Joe Band. 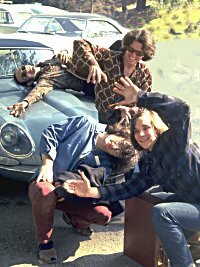 Minus Barry Melton, these four musicians have reunited to capture the psychedelic sound that has been banished to "oldies" radio stations and basements full of warped vinyl. Encouraged by the nation’s political division caused by the war in Iraq, The Country Joe Band is back with an edgy sound that is strengthened by a political voice. After Country Joe & The Fish parted ways in the early 1970s the band members went on to become successful in their own right. Barthol went on to become an award winning composer/lyricist in the Tony-Award-winning political theater group the San Francisco Mime Troupe. Cohen moved back to his native New York and is an accomplished composer and pianist. Performing in clubs across the nation and working with Broadway musicals like Rent have fed Cohen’s love of music. He is also a practicing Buddhist and political activist, who has been recently honored by the Harper’s Ferry NAACP. Hirsh moved to Ashland, Ore. turning to his other passion, painting. He is now a dedicated painter and father. Hirsh also owns a very successful graphics company that indulges his passion for the arts. McDonald went on to have a successful solo career throughout the 70s and early 80s, releasing over 20 albums. In early 1990 McDonald’s passion for history connected him with the life and times of Florence Nightingale. His extensive knowledge on the subject has made him a nationally recognized scholar on the life Florence Nightingale. Now back together, the members of The Country Joe Band have taken their experiences from their lives after the 60s and have them applied to this new union. Reunited in the summer of 2004 The Country Joe Band has rekindled a sound and force that is needed in this 24-hour pop culture driven by Britney Spears and questionable wars in foreign countries. During their initial time back together the band began recreating and developing a once-lost sound. 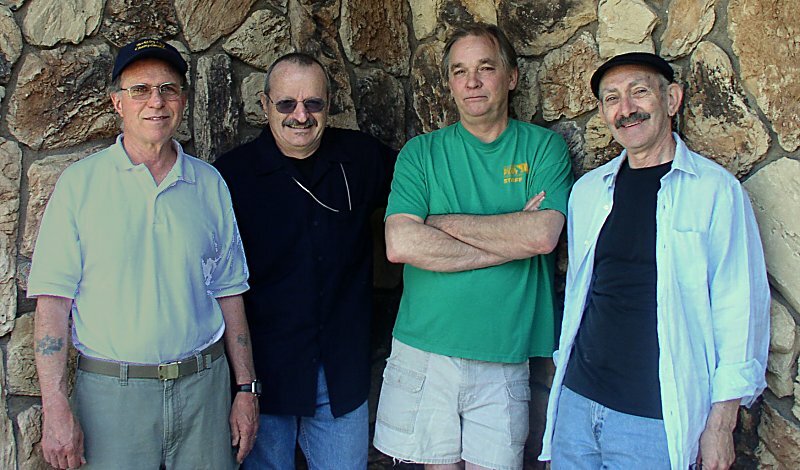 With their new single "Cakewalk to Baghdad," written by Bruce Barthol, the band is picking up right where it left off. R E V I E W S , E T C .
A review of the Lake Tahoe gig. Rip Rense's reminiscences about the band. An interview with Country Joe on Rip Rense's site. A review of a Country Joe Band performance by Norman Solomon. A 1999 interview with David. An article on Joe and the Band from the Berkeley Daily Planet. To hear our new CD single "Cakewalk to Baghdad" click on Richard Perle. I was watching the news, were we gonna attack? Like our soldiers got to do in Basram and Tikrit? The streets and alleys of Baghdad town? Easy to cakewalk in ... not so easy to cakewalk out. 1. Birth information: where, when, time, circumstances, etc. Born at Alta Bates Hospital in Berkeley CA, November 11, 1947 NYC, 8/4/42, 3:35PM Circumstances? I'm not sure what you mean. I was born in Chicago, Jewish and anxious in the year 1940. I was born in Washington D.C., January 1st, 1942. I was not the first born of the year in the hospital so I did not get a prize. My parents were not married but got married a year and a half later when my grandmother came to see the new baby. They stayed married for the rest of their lives. 2. Family information, siblings, mom, dad, et al. One older brother (who built a boat and sailed it around the world), Mother was social worker and father a Professor at UCLA. One older brother. Mother and Father deceased. Mother was an elementary school teacher. Father was a dentist. My father died of Alzheimer’s in 2000, and my mother died remembering in 2003. My brother and sister live in San Jose. My mother was the daughter of Russian-Jewish immigrants. My father was the son of a Presbyterian minister farmer and school teacher. I have a younger sister and younger brother. 3. When did you start playing musical instruments? What instruments? Started fooling with the guitar when I was 11, clarinet at 13 and bass at 18. Piano at age 7, guitar around 12. I took piano lessons for about 7 years and hated it. But when I discovered the guitar, it was like a love affair. I couldn't not play. I would get home from school around 3:30, go to my room and play my guitar for about 6 hours, do maybe 15 minutes of homework and go to sleep. That was how I spent my high school years. My first instrument was furniture @ age 13. I didn’t own a drum, and I was taking lessons on a practice pad. I found pots and pans and furniture much more interesting to play on. I bought my first set of drums @ Franks Drum shop in Chicago in 1954. My father told me that my first instrument was the “Hawaiian guitar” and that I took lessons when I was about 4 or 5 years old. I do not remember that. At the age of 10 I started playing the trombone. I took up the harmonica at the age of about 12 years. I started the piano at about the same age but did not continue. I started playing the guitar at 15. 4. First musical group you played in? How and why? First gig was with a banjo playing friend. The Lane County Bachelors, with Artie Traum and Eric Nagler. Folk music, around 1958 or so. We played, I think, two gigs before we broke up. Artie and Eric were friends from the Washiington Square Folk Music scene. And what a scene it was! My first steady gig was weekends @ the Kerosene Club in San Jose, CA. 1957. I was still in high school, and had a fake I.D.... I was playing jazz to drunk San Jose State students. Very cool…. A weekend beatnik. The first musical group was the Cherry Lee School Orchestra. I played the trombone. It was in grade school in El Monte, California. 5. First rock and roll band experience? Country Joe and the Fish. I saw the two Beatles' movies, Hard Day's Night and Help! back to back in 1965 and decided to become a rock and roll star. Went to California from NYC and joined a band called Blackburn and Snow, playing guitar. Fooled around with a bunch of other musicians in Berkeley and hung out at a club called "The Jabberwock." I was really only interested in playing guitar, but I used to bang out some boogie-woogie on an old piano they had there. Barry Melton liked the way I played the piano and when Joe decided that he wanted an organ sound in his band, Barry said, "Well, David can play the organ." Of course, I never played organ before, but I joined the band, anyway, doubling on guitar and organ, which I learned "on the job." I would steal my own licks from the guitar and play them on the organ, and I'd get these reviews that said, "What a unique style." Eventually, I actually did learn the organ. So much so, that I have an instructional video on Homespun Tapes, but that's another story.... My first rock band was Blackburn and Snow in, I think 1965. Kingston Trio management controlled us; our record never was released. We played the Filmore early on; it was a very tight over rehearsed folk rock band. I had my first rock band at 15 years. It was called the Nomads. It had snare drum, saxophone, guitar, and vocal. 6. When did you first play with Country Joe? Under what circumstances? Joe and Barry and I were living in a house in Berkeley in '65-'66. Played next door at the Jabberwock coffee house. 1965 at the Jabberwock. We were all hanging around the club and sort of played together but not as CJ and F. That happened later. I joined Country Joe and the Fish shortly before we recorded the first Vanguard LP.... We spent a week rehearsing and performing nights at a place called the Barn in Santa Cruz. It was an intense amazing process since the band had been playing with another drummer with a different playing style. My job was to fit in …. My forte. My mind was blown; the group was so unique. I got to play with mallets, brushes, in 6/8, 3/4, eastern, Dixieland, rock, blues, psychedelic, and Joe’s material had content. In 1966 Barry Melton and I started the group Country Joe and The Fish. At first we had a different drummer than Chicken. Bob Dylan had gone electric and we wanted to stop being a skiffle band and be a rock band. We continued to play my songs and some folk songs. 7. When was the first time you played with the present Country Joe Band line up? In 1966. In 1966. Same as above. 1966. 8. When was the last time you played with the present Country Joe Band line up? 9. What kind of music do you listen to now? All kinds. Blues. I'm kind of narrowminded when it comes to what I listen to. I also like traditional Irish music and traditional Folk music. Some singer/songwriters. Bluegrass. Country Swing. Some Jazz, but it's really case by case. Some Classical. I love Fritz Kreisler violin pieces. I mostly listen to jazz. Rock and roll; folk; gospel; blues; rap; R & B. Most anything except pop. 10. What kind of music do you hate to listen to now? Bad music. Duke Ellington said that there were only two kinds of music. Good and bad. I hate bad music. I'm not a fan of rap and modern R and B. Hip hop. But even so, there are some good lyrics, if I feel like wading through the noise, which I usually don't. I don't really like orchestral arrangements of pop tunes. I would much rather hear Ella Fitzgerald with just a piano or a trio. I don't like music that sends a negative message. There's enough negativity in the world, already. 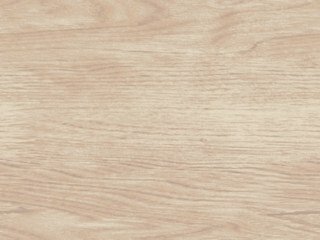 I really don't like music that is not made by humans, like computerized "music." I want my drums to be played by a drummer. I have a clear esthetic concept which differentiates music from noise; I know it when I hear it. I also find the artist's intent to be important to my appreciation, which leaves out a lot of pop music. Heavy Metal and Noize. 11. Do you have a partner in love now? Tell us something about that partner. Do you believe in love? Do you love playing music? If so why? I met my partner when I was working on a play in Manilla, Philippines Yes. Maureen and I have been married for 14 plus years. We are both Buddhists. We chant Nam Myoho Renge Kyo. We met when I came to NYC in 1988. This is my third marriage, and the best one. I do believe in love and I love playing music. Music has the power to reach people's hearts. Daisaku Ikeda, president of the SGI, the Buddhist lay organization that Maureen and I (and about 12 million others) belong to says: "Art is the cry of the soul from the core of one's being. Creating and appreciating art set free the joyous soul trapped deep within us. That is why art causes such joy. Art, quite aside from any question of skill or its lack, is the emotion, the pleasure of expressing one's life exactly as it is. Those who see such art are moved by its passion , its strength, its intensity and its beauty. That is why it is impossible to separate fully human life from art." Terry and I have been married for 28 years. She’s very smart and cute too. We have three children. We have lived in Ashland, Oregon for 25 years. I love Terry and our life together. I have been married and in love with my wife now for 22 years. She is a labor and delivery nurse. I believe in love and that it is the only thing that makes life worth living. Music keeps me from going insane ... that and a higher power. 12. What is your favorite color? food? TV show? drug? musical instrument? Red, paella, West Wing, reefer, cello. I like all colors. And, all food (well, almost). I don't watch much TV, but I've got to say that my favorite show was Your Show of Shows. (I guess that dates me.) Drug? Originally, I wasn't going to answer that, but I guess I will. I stopped using all drugs (which for me was basically cannabis) in 1980 and for about 20 years I missed smoking pot. 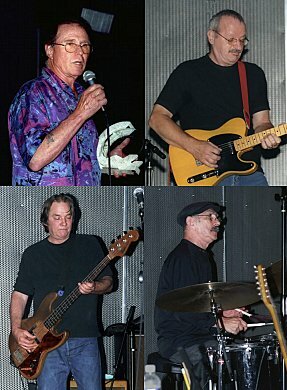 In 2001, while on the road with the Bill Perry Blues Band, I started smoking again. So, the answer is marijuana, but I really only smoke on occasion, now. If there was only one instrument that I could have I think it would be a steel string acoustic guitar, but I love the piano, too. My favorite color is "my life’s work." I have been painting since studying at The California College of Arts and Crafts 1960-63. I have continued to paint, and still can’t decide on my favorite color. My favorite T.V. show when I just want to potato out is the old movie channel. My favorite food could be bananas because they are funny. They are also my favorite drug for the same reason. My favorite musical instrument is the piano (even though I can’t play a lick). It’s so orchestral. I think of myself as musician first and a drummer second. That is to say I love the role of drums in the interplay of ensemble music. My favorite color is green. My favorite food is Japanese Sweet Potatoes. My favorite drug is Sleepy Time Tea. My favorite musical instrument in the acoustic guitar. 13. What is your favorite musical memory of playing with Country Joe? Playing on the back of a pick-up truck on an anti-war march in San Francisco. Well, the Monterey Pop Festival was the best gig I've ever played, but the band didn't really sound that good. There were many great moments, and Joe and I have played as a duo since then. This is a hard question to answer. I guess I have to say that playing with Joe is a pleasure and, well, I'll leave it at that. I look back fondly on that first week of rehearsals at the Barn. It was that band's honeymoon. At the Jabberwock Coffee House in 1966 in Berkeley, California.